The Awami League administration is all set to make good on their election pledge of delivering all the benefits and conveniences of the cities to the remote areas and are planning to achieve the feat digitally. People familiar with the matter said that in a step forward to digitalisation, the government has taken the initiative to prepare 900 digital services amongst which 200 are almost ready. The ruling party in their polls manifesto said that if voted to power, they will take initiatives to deliver all the comforts of the cities to the rural areas including electricity and proper roads that will connect the villages to the district and Upazila towns. They also pledged to ensure that technology and internet would be accessible to them. According to experts, the fastest way to ensure that the rural areas enjoy the comforts of the cities is digitalization. They said that forms, job applications, land ownership records, general diaries, passport forms and many other services will be available in the digital format. They will no longer have to go to the Upazila headquarters for special services and will be able to enjoy them from their home of nearby digital service delivery point. “During the last term we marked all the services of each ministry,” said Telecoms and IT Minister Mustafa Jabbar. “We were able to find 2,760 government services and were able to mark 900 that the directly related to the people,” he added. The minister said that they aim to ensure that those services are in the palm of people’s hands and hence will try to make them mobile compatible. Jabbar said that currently there are around 90 million phones in use in the country among which around 30 percent are smart phones. In order to make 3G and 4G services popular, smart phone use has to go up and people will be able to access the digital services from their homes. “We are developing two apps as well in addition to the 900 services. One of them is a child safety app,” Jabbar said, adding that they are developing a digital version of the Muslim Holy Scripture Quran as well. He said that they have been able to identify what app each ministry needs which have speeded up the digitalisation process significantly. 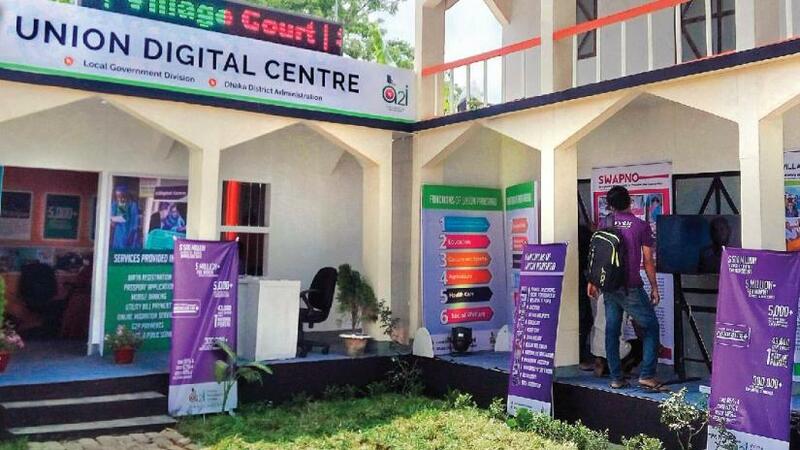 Moreover, the Union Digital Centres (UDCs) are being used as service delivery points. In addition to that the post offices will be used as service delivery points so that people who don’t have smart phones will be able to avail the services from there. Using the ‘Sheikh Russel Digital Labs’ built across the country as service delivery points in the rural is also being considered. Meanwhile, the ICT Division’s access to information has been picked to implement the 900-service initiative and according to sources the work is underway. Experts are of the view that 900 apps for the services are not a feasible option. They said that the government has to develop one app that will incorporate all 900 services and make them easily accessible.